The wall of Lucca, one of the most beautiful city walls in Europe. Lucca has one of the most impressive, completely preserved city walls in Europe. The wall with the Italian name „Mura di Lucca“ is about 4 km long and completely surrounds the old town. The city wall is in many places more than 10 meters high. Through 6 gates you could enter the city in former times, today there are more entrances. On the wall planted with trees there is a wide circular path. 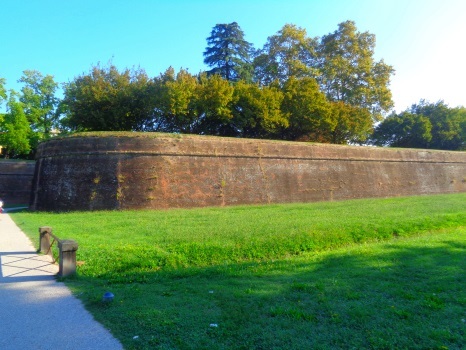 The wall of Lucca was built in the 16th century. It is completely preserved until today. Substantially later the city wall was planted with trees. There is a wide path on the wall. Cars have not been allowed on the wall for several decades. You can walk or cycle on the wall of Lucca today. The Wall Trail is popular with tourists and locals alike. Many inhabitants of Lucca jog on the wall or go for a walk with their dog. Some tourists rent a bicycle or a tandem, also carriage rides are offered on Lucca’s city wall. For us the Mura di Lucca belongs to the top 10 sights of Tuscany. You have a wonderful view of the old town from above. Right in front of the train station you can see the famous Cathedral San Martino Lucca from the wall. 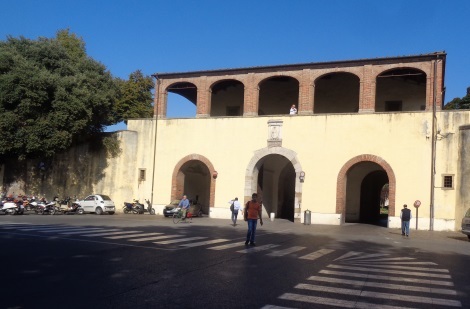 The picture above shows the wall of Lucca from the outside near the station of Lucca. As soon as you leave the station you can see the „Mura“. There is no city gate directly at the station. But as a pedestrian, you can take a small path to the wall, on a staircase you get to the top of the city wall. You should walk a whole round (walking time without breaks about 1 hour). There are many benches on the way to rest, many with great views. There are 6 old city gates integrated into the city wall. Today there are many more entrances, especially for pedestrians and cyclists. Most cars still use the old city gates. Around the city wall there is a wide ring road on the outside. Of course, the wall, like most city walls in the world, was first built as a protective wall going attacker. The Mura of Lucca has a width of up to 30 meters and a height of 12 meters. Later, the city wall also protected the city during floods. The gates were simply closed and the water could not penetrate the old town..
On the outside there is a wide meadow in many places. Golf is played in one place, sometimes even a tournament. You can watch from above on the city wall of Lucca. Bicycles can be hired at several shops near the wall. 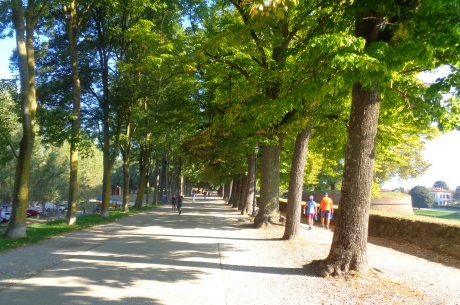 The path along Lucca’s city wall is ideal for cycling. There are also tandems. Directly next to the city wall, in the north-eastern corners on the inside, is the Botanical Garden of Lucca, worth seeing.